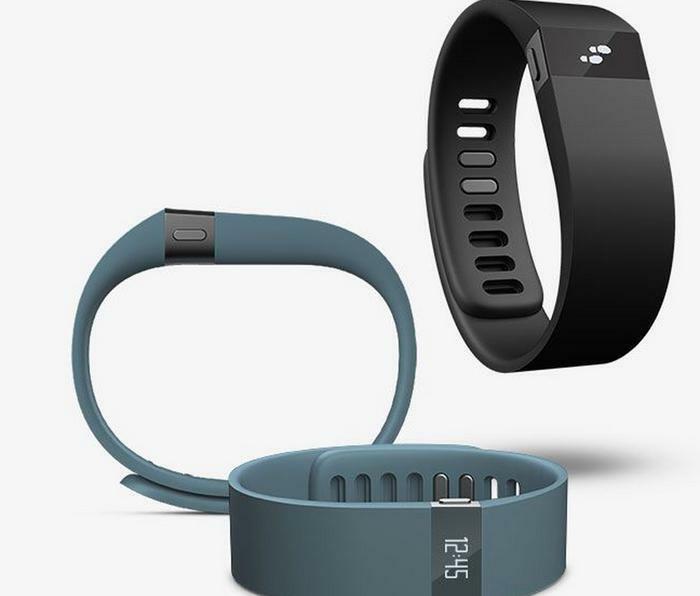 Fitbit says it's "dedicated to helping people lead healthier, more active lives" by selling them wristbands that measure their physical activity. There is one little problem, though, aside from the $129 price of the Force, one of the more popular bracelets. 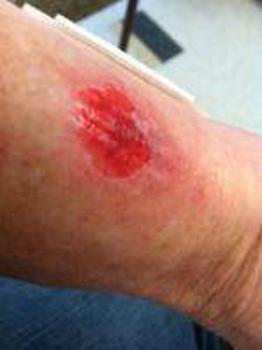 Purchasers say they're breaking out in painful and unsightly rashes on their wrists. A company spokesman is quoted as saying the complaining consumers are probably suffering from contact dermatitis. The company has suggested it's nickel dermatitis since nickel is a component of the metal bracelet. Customers aren't so sure though. Those posting comments to ConsumerAffairs and elsewhere say that some sufferers have tested negative for nickel dermatitis while others who say they have a severe nickel allergy have not reacted at all to their Force. One reader also noted that the burns are appearing mostly on the top of users' wrists, not on the bottom, where the metal clasp is located. 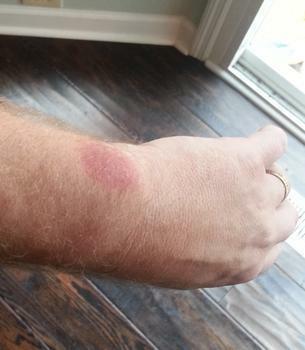 Doug MacLeod, a Fitbit user, had an allergic reaction over the holiday season, when his dermatologist mother-in-law was visiting. "She said I was allergic to something on the back of the Force and told me to paint the metal on the tracker with nail polish. I did not want to ruin the charging port so I opted to cover the back with electrical tape and switched wrists," he said. "The other wrist reacted through the tape in one day." MacLeod said his mother-in-law prescribed a very strong steroid Fluocinonide and he started healing within a day. "[She] stated it is nothing to be concerned about -- just a very angry allergic reaction to something on the tracker. I would simply like to know what I am allergic to. In my case it is not nickel," MacLeod said. "If it's not nickel, what is it?" one reader asked. Good question, but so far no one seems to know. Mary Beth Bissig, a registered nurse, insists that the reaction she and other wearers have had is not typical of a nickel allergy. "If you read the description of nickel allergy on the Mayo Clinic web site your referenced, it states that a reaction will most likely occur within 12 to 48 hours after exposure. That is not what is happening with the Force. It is weeks and weeks later," she said. "And it has been consistent - no one is reacting in the first day or two of wearing the Force. They are reacting weeks later. This is not a typical nickel allergy reaction." Whatever it is, there will be more cases as the popularity of the Fitbit continues to grow, Bissig noted. "Those who received a Force for Christmas are starting to have reactions -- it is within that time frame now. ... [O]ur forum group has over 500 confirmed cases. All reacted after weeks of wear." She said members of the forum have tested for radio frequency burns, off-gassing, pH changes at the metal and battery leaking, so far with no conclusion. "I understand that the nickel allergy theory is the company line at the moment. I don't believe they have a clue what the real cause of the reaction is," Bissig said. "Nickel allergy shifts the blame to the consumer and away from the company, its manufacturing process or the fact that it is manufactured in China -- source of bad pet food and baby products in recent years." It might be good news if the cause turns out to be something other than nickel, since doctors say that once you develop nickel dermatitis, it's there for good although treatments can reduce the severity of the symptoms. "A nickel allergy usually develops after repeated or prolonged exposure to items containing nickel. Treatments can reduce the symptoms of nickel allergy. Once you develop nickel allergy, however, you will always be sensitive to the metal and need to avoid contact," according to the Mayo Clinic website. Jewelry and body piercings are also frequent sources of the affliction. Fitbit is offering refunds to affected customers. Health apps -- healthful or a health threat?